Pigmented neurofibromas are usually seen in Neurofibromatosis 1 patients and make up about 1% of all neurofibromas. They are diffuse type and show clusters of melanin-containing epithelioid or dendritic cells. 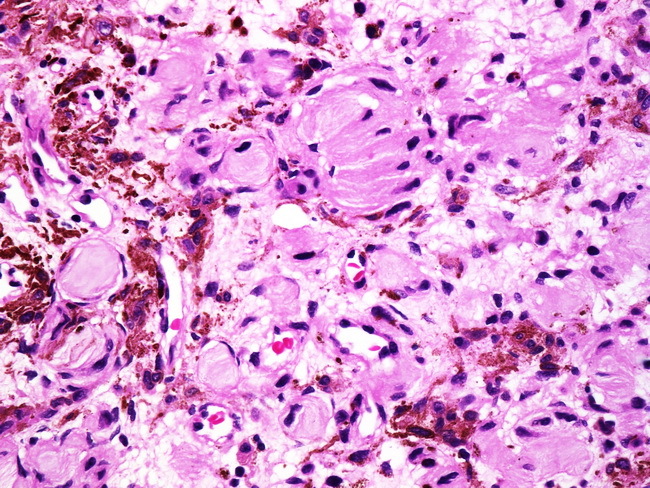 This image also contains numerous organoid structures resembling Meissner corpuscles (pseudo-Meissnerian bodies; shown in this image). Both S-100 as well as melanin markers are expressed in these cells. The pigment is usually not obvious on gross examination. The differential diagnosis includes pigmented dermatofibrosarcoma protuberans (Bednar Tumor; uniform fibroblastic cells, storiform pattern, lack of S-100 expression), blue nevus, and malignant melanoma.